How Was Inuit Knowledge Used at Fort Conger? 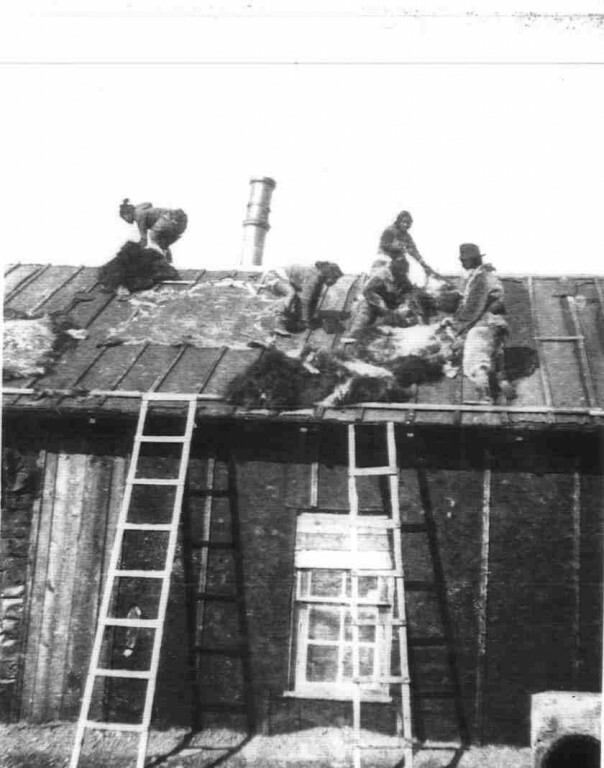 Inughuit hunters use the roof of Greely’s abandoned expedition house to prepare hides. Inuit traditional knowledge played a significant role in the history of Fort Conger and related sites. The Peary Era of arctic exploration marked a radical shift in approach to polar expeditions, differing noticeably from earlier European or Euro-American expeditions, especially in the role of Inuit traditional knowledge. Earlier expeditions to the High Arctic made limited use of a few Inuit guides, hunters and dog sled drivers but largely relied upon Western approaches to the arctic environment. The disastrous conclusions of the British Arctic and Lady Franklin Bay Expeditions to northern Ellesmere Island prompted a fundamental rethinking of arctic exploration. North polar explorers began to realize that if they were to survive in the Arctic, much less attain their exploration objectives, they would need at the least to study how Inuit had lived successfully in this region for many generations while European and American explorers perished. Inuit traditional knowledge was particularly evident in the first North Pole expedition of Robert Peary, 1898-1902, when his party refitted the site to serve as a base camp for his efforts to reach the Pole. During this expedition Peary not only drew upon Inuit knowledge, he relied upon Inughuit (Inuit from northwestern Greenland) to provide the bulk of physical labour for his expedition parties. Inughuit men broke trail, drove the dog teams, hunted to feed both humans and dogs, and performed the bulk of the manual labour on Peary’s expeditions. Inughuit women stretched and prepared animal skins, sewed fur and skin garments, Aboriginal sleeping bags and tents, prepared food and looked after their children and families. After moving his expedition base from Cape D’Urville on central Ellesmere Island to Fort Conger in the north in 1900, Peary ordered the navigator of his expedition ship, the Windward, to sail north through the Nares Strait for intended use as his wintering quarters. However the ship was unable to penetrate the congested pack ice of southern Kane Basin and failed to reach its destination. His party then relied on an emergency plan, based on Inuit precedent, involving the dismantling of Greely’s large expedition house and reusing the lumber to build the complex of smaller shelters which still stand today. The Inuit in northwestern Greenland would take full advantage of the natural topography to locate their semi-permanent villages on sloping ground, with long entrance passages excavated from the side of a slope, with the house invariably cut higher into the hill. Similarly at Fort Conger the complex of shelters was built into a rise, facilitating the excavation of semi-subterranean dwellings and providing enhanced protection from the elements. 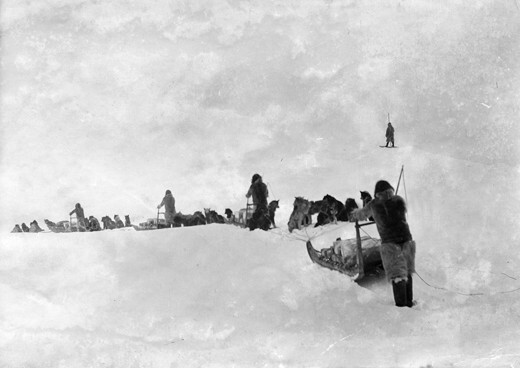 Inughuit sledgers and dogs struggling to push and pull a komatik up a steep area of pressure ice, 1908-09. The igloo-sized shelters, which measured between 3 and 3.5 metres long and 2.15 to 2.8 metres wide, were of simple frame construction. They were built by driving wooden corner posts into the ground at 90-degree angles, adding additional studs in the long sides, and nailing wall plates across the top of these vertical supports. Inner and outer walls were constructed by cutting horizontal tongued and grooved boards and nailing them to the studs. Wooden strips were then used to tack tar paper to the roofs; these also served as retainers for the sand, gravel, and dirt that was heaped on the roofs for insulation. The three main shelters were linked together with excavated tunnels covered over with stretched muskox hides and, after the onset of snow, with snow-block domes. As was the traditional Inuit practice, the party took advantage of the topography to build low-lying entrances to the dwellings preventing warm air from escaping upon entering or exiting. Insulating the complex with several layers, including earth between the joists and on the outside of the buildings, the party piled snow around the entire complex to give it a further insulating layer in the long winter. Peary was also aware of the practice of Inuit in the Central Arctic to build inter-connected igloo complexes, although it was not the general practice in Avanersuaq (Northwest Greenland). He had read the earlier account of the second arctic expedition of the explorer Charles Francis Hall, who observed Inuit snow villages of interconnected dwellings and ancillary structures in the Central Canadian Arctic, all sharing a common entrance passage and central igloo to conserve heat. 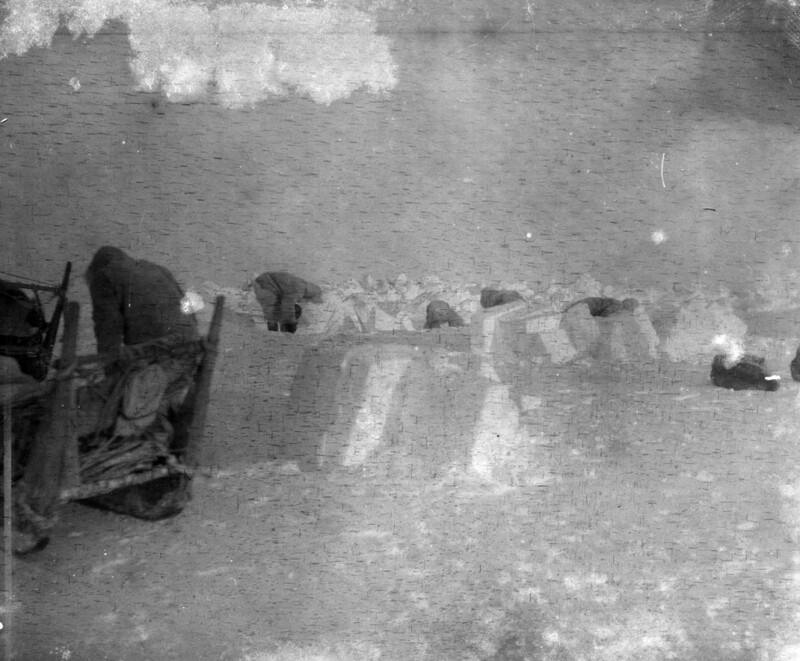 In virtually every other respect, the Fort Conger complex drew upon precedents in Inughuit traditional knowledge, especially the construction of dug-out entrance tunnels to prevent the loss of precious heat. Robert Pearys hut complex, as it appears today. 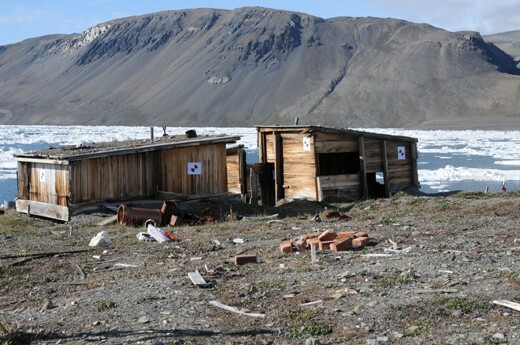 As well, similar to the Inughuit practice of linking their settlements to temporary camps across their homelands, Fort Conger became the nucleus of an array of hunting camps stretching across northern Ellesmere Island. For centuries the development of summer camps and ancillary settlements enabled Inughuit to move across the land seasonally to various sites of resource procurement. It was the only viable strategy of survival in a region in which available game animals are few and far between. In keeping with traditional Inughuit practice, Peary’s party relied upon Inuit methods of caching and set up ancillary hunting camps in areas of recurrent natural resource use, where they collected cached meat and trans-shipped it back to Fort Conger. For the winter of 1900-1901, when his party was based at Fort Conger, these included quasi-permanent camps at the Ruggles and Crozier rivers. While his overriding goal of reaching the North Pole would not customarily be of importance to Inuit, they nevertheless greatly assisted the explorer in his notable efforts to attain this elusive prize, which Peary, four Inughuit and Matthew Henson might have reached on 6 April 1909. With the technology available in that period, this attainment would not have been possible without their heavy reliance on Inuit traditional knowledge. With the relocation of Canadian Inuit to Ellesmere Island beginning in 1951-53, Inuit traditional knowledge again came to the fore. In observing their environment carefully, and learning its opportunities and constraints, Inuit accumulated a body of data and wisdom that has continued to guide the community of Grise Fiord up to the present. Through the Joint Park Management Committee for Quttinirpaaq National Park, senior members of the High Arctic Inuit communities of Resolute Bay and Grise Fiord have ensured the integration of Inuit Qaujimajatuqangit into park operations and decision making for Quttinirpaaq National Park.